Rob was due to write about two fast bowlers who had caused Viv Richards real problems, largely by being dead fast. You’ll have to wait for that piece (but if you can guess both names – and I’ll give you Kent 2nd XI as a clue – and you’re one of the first five to wing them over to me at editor@thenightwatchman.net, I’ll send you a free copy of issue 7) as time got big on Rob, so he had to change horses. With most writers, that’d worry me, but not Rob. He suggested a few other subjects he could develop in a limited timeframe, we picked one and away he went. The result was lovely. Thought-provoking, well researched, funny, and with some killer one-liners. The change in the nature of Test-match batting at the turn of the century, instigated by Steve Waugh, is among the most fundamental changes in any sport in the last 20 years. For every culture there is a counter-culture, however, and the increase in aggressive batsmanship has also served to highlight its opposite: the good old-fangled stonewall. Perhaps it has even facilitated it. 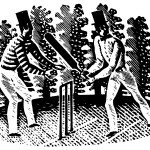 One explanation for the increase in last-day rearguards is that the pace of batting in the early part of a match means that games which would have been bore draws in the 20th century now have the capacity for last-day drama; that, in real terms, they are the equivalent of a six- or seven-day Test in the 1980s. There are fewer draws in Test cricket these days, so it is logical that the leisurely draws of the past are more likely to be fraught scraps for survival nowadays. The arse-nipper is the new bore draw. The last-day rearguard is particularly acute for those who support the batting side. The bowling side go through the wringer too, but at least they already have a draw in the bank. It is a unique form of drama – a scary movie in which scarcely anything happens, but in the most menacing fashion imaginable. Grass growing and paint drying, directed by David Lynch. It does not compare to tight matches in which either side could win, like Edgbaston 2005, because there is only a one-result swing – from a potential draw to defeat for the batting side or a potential win to a draw for the bowling side. Yet such matches are more commonplace because they do not require both sides to have relatively equal scores: one side can end a match 500 runs in arrears but feel like theirs is the moral victory. It is not an easy thing to quantify – Cricinfo’s Statsguru does not allow us to order Test matches by number of coronaries induced – but it does feel like the desperate last-day stonewall is becoming more commonplace. One statistic supports that perception. In the 20th century, 11 Tests were drawn with a side nine down in the fourth innings. In the 21st century it has already happened 11 times. England were involved in nine of those 11, sometimes chasing victory, sometimes staving off defeat, as well as Cardiff 2009, which does not make the 11 because England were hanging on in the third rather than fourth innings. The fact the 19 longest fourth innings all came in the 20th century suggests the desperate rearguard doesn’t quite have the same scale as before, though the drama is barely less intense for that. Arguably, given sport’s increased self-importance, the drama is greater. And there have still been some epic backs-to-the-wall performances. South Africa batted 148 overs to save the match at Adelaide in 2012, the longest fourth innings since Mike Atherton went the distance and then some at Johannesburg in 1995, while England used up 143 overs in their unlikely draw at Auckland in 2013. South Africa and England are the teams who have brought the last-day struggle back into Test cricket, yet they have gone about it in different ways. England, for whatever reason, have been magnetised towards the tight finish since the West Indies tour of 2008–09 up to the recent Sri Lanka series. South Africa have not been involved in as many, yet they have done something even more interesting: reintroduced the brazen blockathon, using the dead bat to give the stonewall the kiss of life. Theirs is a thrilling kind of staid deviancy. It felt as if, in the past, an attempt to save the match on the final day was constructed with a kind of computerised logic: the fewer attacking shots I play, the less chance I have of getting out. That’s all that matters. “I hit a four and I was so angry with myself,” said Jack Russell in All Out Cricket of his performance at Johannesburg in 1995, when alongside Atherton he made 29 from 235 balls with three self-loathing boundaries. That was in the 1990s. Then Test batsmanship changed. Not only did batsmen appear happier to keep the scoreboard moving, with batting time now a dying art, but it became a received wisdom that exclusively negative batting, for all its ostensible logic, caused many problems. That a batsman would get into a rut; that it was beneficial to feel bat on ball and to get your feet moving; that everything was interlinked and it was far better for a batsman to play a mildly diluted version of his natural game than to allow the water-torture of dot after dot after dot. Outside either South Africa or Paul Collingwood’s beautiful brain, that attitude still predominates. When Matt Prior famously saved the match and series for England in New Zealand – a performance imbued with subsequent poignancy because of the dramatic decline that began straight after that innings – he did so by carting 110 from 182 balls. South Africa, however, have been brilliantly unashamed in their defensive approach, to such an extent that, when they went into the second and final Test in Sri Lanka needing a draw to win the series and return to the top of the ICC Test Rankings, they were almost playing for a draw from the very first ball. It was cricket catenaccio, like seeing a football side with a 1-0 lead from a European first leg play for a 0-0 draw. In the 20th century a batsman could stonewall on days one to five – batsmen like Chris Tavaré and Trevor Bailey seemed to misunderstand the hippy mantra and treat every day like it was the last and there was a draw to secure – but now it generally only occurs when needs must, on days four and five. For supporters it is a unique experience, confusingly moreish and the most exquisite torture this side of being hit amidships by a Mark Waugh on-drive. It’s the kind of thing that, when you’re in the moment, makes you want to announce your immediate retirement from watching cricket and go and live in the woods for a month until your heartbeat returns to a vaguely normal level. Then, the morning after, the turkey is pretty damn cold. Goodness knows what it is like for players. James Anderson gave us a sizeable clue with his tears after the defeat to Sri Lanka at Headingley. In 1989–90, when England were 1-0 up with two matches to play and in sight of a staggering triumph in the Caribbean, Robin Smith and Jack Russell defended for hours on the last day before Curtly Ambrose obliterated England with the second new ball; Wisden Cricket Monthly said their defiance “brought a lump to the throat”. The batsmen who spend a significant amount of time in such circumstances leave pieces of their soul scattered over the wicket. Sometimes the sacrifices are more visible: the Barbados sun burned the skin off Hanif Mohammad’s face during his 970-minute 337 against West Indies. Test cricket is an extreme test of character – that’s why people tell us that that’s why they call it Test cricket every five minutes – and the last-day rearguard is more extreme still. It demands that players demonstrate parts of character that they don’t even know they have, and is perhaps the ultimate test of substance over style. For all the beautiful shots played by Moeen Ali in the early part of the summer, it was his strokelessness against Sri Lanka at Headingley that gave the impression he might have something special with the bat. The demands of abstinence have become even greater since Test-match batting underwent the change. We often talk about the oxygen of runs, yet they are more like food – you can survive for much longer than you think but the trick is to train the mind and the will accordingly. Stonewalling is cricket’s version of a hunger strike – or, worse still, like depriving a narcissist of their Twitter account. It is almost entirely counter-instinctive for a modern batsman not to try to score runs. Adam Gilchrist’s mantra was “just hit the ball”. The alternative “just leave the ball” doesn’t have quite the same ring. Yet every batsman, even the most attacking, has an inner Tavaré. Most just don’t know – or don’t want to know – how to channel it and find the necessary zen zone to play barely any attacking strokes. South Africa have shown how readily it can be done. And there is something beautiful about watching an attacking batsman deny his basic instinct. Like when Ian Botham scored 51 from 209 balls to save a Test against Pakistan in 1987. The most striking example of switching gears came from AB de Villiers during South Africa’s tour of Australia in 2012–13. He made 33 from 220 balls to save the Adelaide Test and then, six days later, bashed 169 from 184 balls to win the Perth Test and the series. It made Jekyll and Hyde seem like twins. For some, constructing an innings on a need-to-play basis comes easier than others. Collingwood was nicknamed “Brigadier Block” in recognition of his over-my-dead-body innings: 36 from 153 on his Test debut at Galle when England drew nine-down, 22 not out from 119 at Adelaide in 2006–07, 74 from 245 at Cardiff, and then 26 not out from 99 and 40 from 188 in South Africa the following winter. He even made 2 from 50 balls in a failed rearguard in New Zealand in 2007–08. “It is a skill – a mental skill more than anything else – not being worried about how you look or scoring runs, and I think you’ve got to understand the situation you’re in before you go out there,” he said during the South Africa tour of 2009–10. “The attitude is that if anything is wide, leave it, anything short, drop your hands, and anything on the stumps, block it. You keep it as simple as possible. I’m out there to waste as many balls as possible.” Not so much passive-aggressive as aggressive-passive batting. The traditional scoreboard has been adapted in recent times – Twenty20 cards show dot balls rather than maidens – so maybe we should have a point at which the scorecard goes into Rearguard Mode. Instead of saying that JP Duminy made 3 (65 balls) against Sri Lanka in the second innings at Colombo, the scorecard would read JP Duminy LBW b Perera 65 (3 runs). Rearguards produce all manner of fascinating numbers. Never mind the days of Sam Fox’s quantitative merits; it takes a special kind of man to get excited about 50-31-49-3 or 45-30-40-5. They were the second-innings figures of Nathan Lyon and Rangana Herath at Adelaide in 2012 and Colombo in 2014, both desperately trying to get blood out of a stonewall. The cult of the stonewall has even spawned collectable memorabilia, from “I’m The Real Brigadier Block” T-shirt to the Danny Morrison tie. When The Wisden Cricketer hailed cricket’s greatest mavericks in 2008, Glenn McGrath was included for demonstrating monastic metronomy in an age of impatience. The stonewall has a similar maverick quality. It also has a place for McGrath, who survived the last four overs with Brett Lee at Old Trafford in 2005. It is when the bowlers are facing that the rearguard gets even more fraught; we can, to some extent, trust batsmen to do their job but bowlers with the bat are required to perform a task for which they have little or no natural aptitude. Most bowlers can bat a bit these days, but when they decided to spend all that time in the nets it’s unlikely they ever dreamed of having to bat the last 10 overs to save a Test. That, surely, was not in the brochure. As such they are not just out of their comfort zone; they’re in a different postcode to their comfort zone. Sometimes, a little absurdly, it defines the careers of these tail-enders. Graham Onions took 32 Test wickets and should have had the chance to take a lot more, yet he will probably be best remembered for batting out the final over twice to save a Test in South Africa. If you did a Family Fortunes-style survey of Monty Panesar’s career, asking 100 people to name one highlight of that career, his batting at Cardiff would doubtless come out on top. Test cricket is under enormous pressure from Twenty20: not just for its existence, but for its identity, as a new generation arrives with practices and attitudes developed in short-form cricket. Yet it doesn’t matter how fast batting becomes: unless we return to timeless Tests, or Test cricket becomes extinct, there will always be a place for a different kind of hero, one who doesn’t buckle his swash and who believes in derring-don’t: the good old stonewaller.